Combining crafts?! Not for the purist I suspect, but let’s not judge. I belong to quite a number of social media arts and crafts groups and I often see artists/craftspeople mixing media. Of course, this has been practiced throughout art history. Just look at Picasso and a work such as ‘Bottle of Vieux Marc, Glass, Guitar and Newspaper’ from 1913. 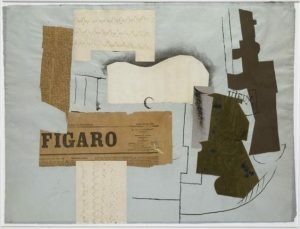 This Cubist paper collage not only represents its title, but includes cuttings from Le Figero newspaper in the work itself. 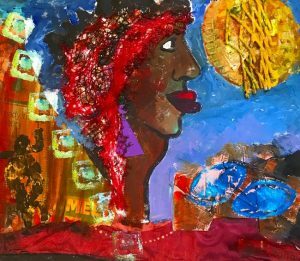 One of my good friends and contemporary artist, Joss Rossiter, uses mixed media in her work with a wonderful flare. One of Joss’s early pieces, Lips, was created with stencils and acrylics plus the use of material sewn into the page (at the bottom), mesh from a fruit wrapping from the supermarket (in her hair), and even the sun has some styrofoam from the supermarket. Recently I have noticed a lot of folks mixing not only media, but crafts too. As you know I am a knitter – both hand and machine. 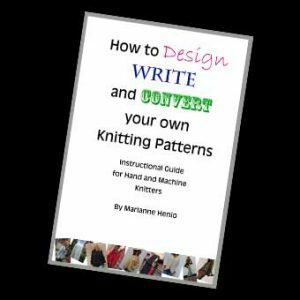 Machine knitting is often referred to by hand knitters as cheating! They are to my mind two different crafts with a lot of similarities, both equally stimulating and beautiful. I prefer to look at both as an opportunity to mix crafts in an artistic collaboration. 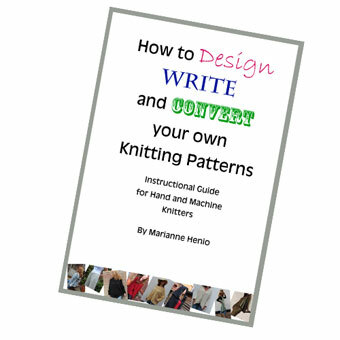 I often combine hand and machine knitting in my designs. Adding a collar or cuffs that have been hand knitted in a fancy yarn to a machine knitted garment is always a great combination for me. Likewise, using crochet to finish off edges or join seams is both creative and effective. The work of machine knitter Kirsten Schreiweis often combines machine knitting with sewing. In my Aquarius Jacket design she has used cuts of material to replace the knitted collar of the jacket. 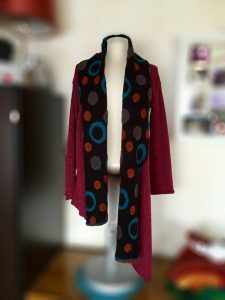 This works perfectly and makes a stunning garment. Combining crafts such as food with mosaic art, art work with quilting, paper crafting with sewing, baking with drawing, glass blowing with wood turning, fusing photography with painting…the list goes on. Then, of course, there is the combination of classical skills of the craftsmaker with modern technological tools. Lots to talk about! Although we look at arts and crafts in quite a serious manner sometimes, it is also about being creative and having fun, following one’s passion, or passions.Through my blogs I want to explore both arts and crafts from all areas with the aim of inspiring and entertaining you, the reader. 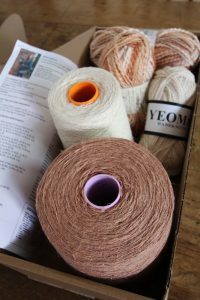 From craft tips to controversy, from fun projects to advice on setting up a cottage crafts business, I hope you will join me here each week for some short, but enjoyable articles. And please feel free to add to the comments section with your views. Brilliant blog, looking forward to more! Just letting you know my surname ends with 2 t’s. I don’t know where the y’s came from.